Lennard Sowah’s last spell at Hamilton Academical ended after only seven games when he left to join Hearts. It is fair to say he regretted the decision given what followed. The German defender is now back where he started in Lanarkshire and ready to face his former club in this afternoon’s Ladbrokes Premiership opening match. Sowah made seven appearances for Hamilton during the first half of the 2016/17 campaign after arriving from Hamburg’s B team. He didn’t hesitate to jump ship mid-season when Hearts offered a short-term contract. He wasn’t given an extension in Edinburgh and moved again to the Polish club Cracovia that summer. He quickly realised the error of his ways but had to endure a year of torture stuck in Krakow. The 25-year-old revealed that Cracovia did not pay his wages on time and money eventually stopped altogether before his one-year contract ended. When the Hamilton manager Martin Canning offered the solace of a return to Scotland, Sowah was only too grateful. “I did not leave Hearts because of something negative,” he told the Evening News. “As a player you want to play and I didn’t see that I would get more game time so I left and tried to find something new. I ended up in Poland, although that wasn’t planned. It happened and I just had to make the best of it. It didn’t really go as well as I wanted. “I didn’t get treated well in Poland. When I came to Scotland, obviously I didn’t know my left and right. Hamilton helped me get an apartment and everything. In Poland, basically I was just on my own. Nobody was speaking English and I couldn’t really talk to anybody. They weren’t really helping. “You expect the club to help you sort one or two things out. I didn’t get paid and every month I was struggling. I had to ask them: ‘I have not been paid. Who do I speak to?’ Nobody was responsible for it. Cannning and Sowah share a mutual friend based in Germany, and he helped arrange the player’s second stint at Hamilton. “I always had a good relationship with the gaffer here. When I first came to Hamilton, it was through a friend who knows him,” explained Sowah. “My friend is not an agent or anything. I was speaking to him about the situation in Poland and he had been speaking to the gaffer. He said the gaffer told him he would like to bring me back. He insists there is no bad feeling towards Hearts and that he will not feel awkward playing against them. Like so many others in recent years, he badly wanted to become the solution to the problem left-back position at Tynecastle. Instead, he sensed he would be marginalised after a difficult run of results. Sowah made 15 appearances in maroon under former head coach Ian Cathro but was on the winning side on only four occasions. “As a player, you have your expectations but you know not everything goes as planned. I went to Hearts, played some games, but in the end I saw myself not being involved as much. I definitely needed to get game time so I was looking for something else. “I don’t think it will be strange playing against them because I am 100 per cent Hamilton. I am going on the pitch to try and beat Hearts. Of course, I played for them and I will probably see a few faces I recognise. Before the game I will just be focused on the football and then afterwards we can have a chat with everyone. There is enough to be going on with rather than worry who is lining up for today’s opponents. 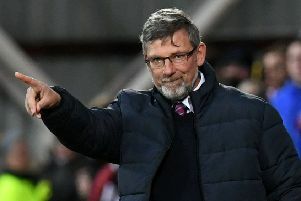 Similar to Hearts, Hamilton have overhauled their squad during the summer. Sowah has plenty to contend with just trying to familiarise himself with new colleagues. Defenders Alex Penny and Aaron McGowan joined from Peterborough United and Morecambe respectively, while full-back Ziggy Gordon also returned for his second spell in red and white from the Polish side Pogon Siedlce. In midfield, Tom Taiwo left Falkirk to join Canning’s squad, Aaron Smith has been brought in from Nottingham Forest and Sam Kelly joined from Grimsby Town. “There are a lot of new players at Hamilton. We all get on and there is a lot of quality,” stressed Sowah ahead of today’s big kick-off. “I think we can do really well this season. We can dream about the top six but just now we must think only about getting results.